Blizzards and windstorms will punish the U.S. Plains and Midwest on Wednesday as a powerful late winter storm threatens more flooding in areas like South Dakota’s Pine Ridge Indian Reservation and farms along the Missouri River. High spring temperatures will give way to heavy snow, gale-force winds and life-threatening conditions across a swath of the central United States running from the Rockies to the Great Lakes, according to the National Weather Service (NWS). The Pacific-born storm has already sparked flood evacuations in Oregon. Rain and then blowing snow was expected to hit the Rockies on Wednesday, before moving east into the plains, the NWS Forecast Office in Boulder, Colorado, reported. “A potentially historic winter storm will bring severe impacts Wednesday night into early Friday,” the weather service’s Twin Cities office tweeted. 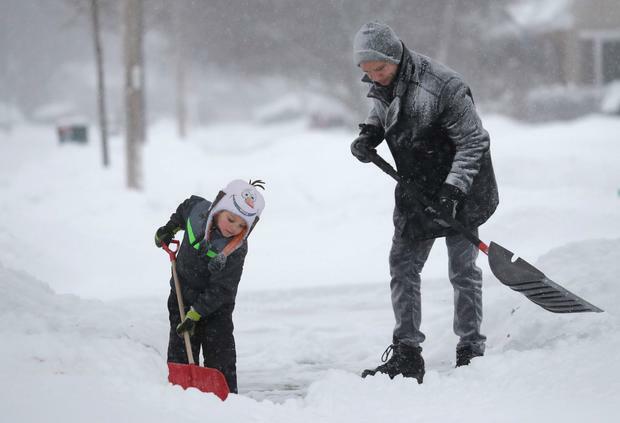 The same central U.S. area was hit by a “bomb cyclone” less than a month ago that brought deadly flooding and blizzards that closed roads and paralyzed transportation. A whiplash in temperatures from a high of 80 Fahrenheit (27 Celsius) in some cities on Tuesday to frigid conditions on Wednesday was expected to supercharge the storm with cold air. That was the case on March 13 when a sudden drop in air pressure turned a potent storm into a so-called bomb cyclone. Areas like the Pine Ridge Reservation and northwest Missouri’s Holt County are still recovering from last month’s flooding which caused billions of dollars in damage. Flooding was not expected to be as bad in Nebraska this time as the ground had thawed and could absorb more water. Still, the coming storm was expected to exacerbate flooding along the Missouri River in areas where dozens of levees were breached in March, exposing communities to future surges. The river was not expected to crest in areas of Nebraska, Iowa and Missouri until between three to five days after the storm.